DAYTONA BEACH, Fla. -- The NASCAR short track season is officially upon us -- huge grins, high spirits, bumpers and intensity all around. Sunday's STP 500 at the half-mile Martinsville Speedway (at 2 p.m. ET on FS1, MRN, SiriusXM NASCAR Radio) opens the test of gumption, patience and short track mastery for the season. Certainly the last time the Monster Energy NASCAR Cup Series visited Martinsville it met all expectations of drama and excitement. With a 2018 championship spot on the line, Joey Logano and Martin Truex Jr. went door-to-door and bumper-to-bumper for the win in an epic duel in the final laps. The two made contact multiple times. Ultimately Logano moved leader Truex out of the way in a "bump and run" move, winning the race and earning his spot to ultimately be in the Championship Four at Homestead-Miami. Logano answered with his first Monster Energy Series championship three weeks later with a victory in South Florida. 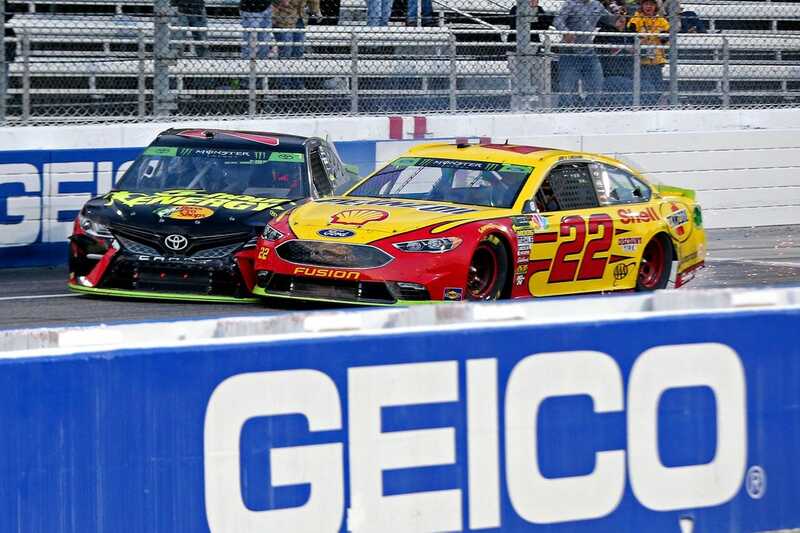 The final lap intensity that Logano and Truex showed last year is every bit what NASCAR fans have come to expect in short track racing -- that particular chapter came complete with a post-race promise from Truex that he would not soon forget the way Logano raced him. The defending winner of Sunday's race, Stewart-Haas Racing's Clint Bowyer earned his first win at the track in a less dramatic, however equally stellar fashion, leading a race best 215 laps. He was one of three drivers who led at least 100 laps on the afternoon (Ryan Blaney, 145, and Denny Hamlin, 111). Over the course of their careers, it's been Jimmie Johnson and Kyle Busch leading the short track (Martinsville and Bristol, Tenn.) statistics among active drivers. Johnson has nine wins at Martinsville and two at Bristol. Kyle Busch has seven victories at Bristol and two at Martinsville. His brother Kurt has six wins at Bristol and a pair at Martinsville, including the longest span between wins there (22 races) between his first win in 2002 and last in 2014. And Denny Hamlin is always a favorite at Martinsville, where he's won five times -- second only to Johnson's nine among active drivers. This year's Daytona 500 winner has four top-10s in the opening five races and won this race last in 2015. Interestingly, over the last 10 races at Martinsville and Bristol, there have been only two drivers to win multiple times at the tracks. Logano has a pair of wins at Bristol (2014-15). And Kyle Busch is the only one to do so at both tracks -- winning twice in that time frame at Martinsville (2016-17) and also at Bristol (2017-18). There have been nine different winners in the last 10 Martinsville races, and eight different winners in the last 10 Bristol races. Three of the last four Martinsville winners -- Logano, Kyle Busch and Brad Keselowski -- already have wins this season. Busch, who scored his 200th NASCAR national series win last week at California's Auto Club Speedway, is looking to earn his third consecutive win and top that magic number. So far he's won on Phoenix's ISM Raceway one-miler and the Auto Club Speedway two-miler and he's eager to see if he can retain his magic in the epic 500-miler at Martinsville's historic half-mile "paperclip." "I think just being able to get comfortable, get settled and make sure that you're good to go for those hauls," Busch said about the demands of racing at Martinsville. "Don't worry about what lap it is ,ever, during a race. That's the worst thing that could happen to you. "You just try to not ever worry about what lap you're on or what's going on around you. You just keep battling, keep driving, keep your focus forward on what you're doing. That's the best way to go about those long, long races." Grant Enfinger leads the series driver championship standings with a six-point advantage over Sunoco rookie Harrison Burton, but history has proven Martinsville remains a race very much up for grabs. There have been eight different winners in the last 10 races. The exception to that is veteran Johnny Sauter, who has won two of the last five. His four career wins are most in series history at the track. He's still looking for his first win of 2019 and ranked sixth in the championship since changing teams this season and returning to ThorSport Racing where he raced from 2009-16. Defending race winner John Hunter Nemechek is not entered this weekend, however one of the track's most high-profile former winners, Bubba Wallace, will be competing. The Richard Petty Motorsports fulltime Monster Energy NASCAR Cup driver is very partial to Martinsville as that's where he scored his first career victory (2013) in one of NASCAR's three national series. He added another in 2014, making Martinsville the only track on the circuit where he's been a repeat winner. Other fulltime Monster Energy and Xfinity Series drivers entered this week include Kyle Busch, a two-time Gander Outdoors Truck Series winner already this year, along with Austin Dillon, Ross Chastain and Timmy Hill, who will debut an entry for his new family-owned team -- Hill Motorsports. Coming into the race, points leader Enfinger and defending series champion Brett Moffitt are the only drivers with two top-five finishes in the opening three races. Neither has won at Martinsville, however. The top-10 in the standings are separated by only 26 points heading into the weekend and show a very diversified points battle with four Fords, three Chevrolets and three Toyotas represented. What to watch for: Ford drivers Clint Bowyer (Stewart-Haas Racing) and Joey Logano (Team Penske) won the two Martinsville races in 2018. The last time Ford won back-to-back races at the track was 2001 when Dale Jarrett and Ricky Craven brought home the season wins for the manufacturer. ... Hendrick Motorsports has won a record 24 Martinsville races. Geoff Bodine (1984) was Hendrick's first winner at the track and Jimmie Johnson (2016) was the last. ...There have been nine different winners in the last 10 Martinsville races and the manufacturer parity is equally as impressive -- four for Chevrolet, three for Ford and three for Toyota. ... There were 11 lead changes in both the spring and fall races at Martinsville last year. ... Johnson is the last pole sitter to win at the track. He did it back-to-back in Fall 2012 and Spring 2013. ... Johnson, a nine-time Martinsville winner, boasts the top driving rating (113.3) and five-time winner Denny Hamlin is second best at 107.0. ... Johnson leads all active drivers in average running position (6.871), laps run in the top-15 (84.1 percent) and average finish (8.0). ... Kurt Busch has the most career starts (37) among active drivers, with one win (Spring 2014) and six top-10s. .... Grey Gaulding (October 2016), Chase Elliott (March 2015) and Michael McDowell (March 2008) all made their Cup debuts at Martinsville. .... Logano has won the most pole positions (four) among active drivers. Darrell Waltrip owns the all-time record of eight. ... Nearly half the Martinsville winners (25 of 52) have multiple wins at the track. ... The pole position is the winningest starting position on the grid (21 victories). .... A victory Sunday for Johnson would make him only the third driver to have 10 wins or more at multiple tracks, joining Richard Petty and Darrell Waltrip. .... The late Dale Earnhardt has the most runner-up finishes at Martinsville (seven). Johnson has the most (four) among active drivers. What to watch for: Defending race winner John Hunter Nemechek has three finishes of runner-up or better in 11 races at Martinsville. ... Johnny Sauter won the race in November. The last time a driver won back-to-back races was Mike Skinner who swept the 2007 season. ... Sauter has a series-best four wins at Martinsville. He is the only repeat winner in the last 10 races, winning in November of both 2016 and 2018. ... In five of the last six years, the Gander Outdoors Truck Series champion scored a win in the opening four races of the season. So far only Daytona winner Austin Hill is eligible. Kyle Busch won the Atlanta and Las Vegas races but the Monster Energy NASCAR Cup Series championship contender is ineligible for the Truck title. ... Veteran Grant Enfinger leads the series driver championship standings. He holds a six-point edge over rookie Harrison Burton. ... Three teen drivers will make their series debuts this weekend, including 17-year-olds Derek Kraus of Wisconsin and Canadian Raphael Lessard along with 18-year-old Juan Manuel Gonzalez, of Mexico. ... Popular driver Bubba Wallace, now a fulltime Monster Energy NASCAR Cup competitor, will be competing in the Truck race. He has two wins at Martinsville including his first ever national series victory in 2013. He is a perfect 4-for-4 in scoring top-five finishes at the half-mile track. ... Sauter is the only Martinsville winner in the last five races to lead the most laps and earn the victory. He led 148 en route to the November win at the track. Previously Ben Rhodes (134 laps in Spring 2018), Matt Crafton (102 laps, Fall 2017), Christopher Bell (96 laps, Spring 2017) and Chase Elliott (109 laps, Fall 2016) led the most laps in a race and did not hoist the trophy. ... Burton leads Sheldon Creed in the Sunoco Rookie of the Year standings. --Holly Cain, NASCAR Wire Service. Special to Field Level Media.